Click here for help with the first two. For the last, we are pleased to offer you the Positive Infinity New Testament, a pdf document which has the New Testament in a pioneer modern English translation. It places on your computer a translation of the New Testament that is readable, searchable and will give you a new perspective on God’s Word. Included with this translation is the story of how it came into being, and a section on weights, measures and currency that we guarantee is unique in any Bible. In addition to the free download, if you want this in print, you can order it here. As an excellent supplement to this, we recommend you also download the Bible Companion, a program which has maps, outlines and other important information to help you understand God’s good news for you. This is a very nice little program that has everything a Bible should contain in the back but often doesn’t. It includes interactive maps, a daily Bible reading guide for a year, a chronology, weights and measures, and other interesting Biblical items that are really handy to understand and know the Bible and what it means. Bible Companion is freeware but its distribution terms are contained in the readme.doc file. It is a DOS program and takes very little disk space. Click here for more information on this program. Create a directory where you want to place Bible Companion. Unzip the downloaded bcomp.zip file into the directory. Run the program bcomp.exe. The other files are either data files or contain other program information. 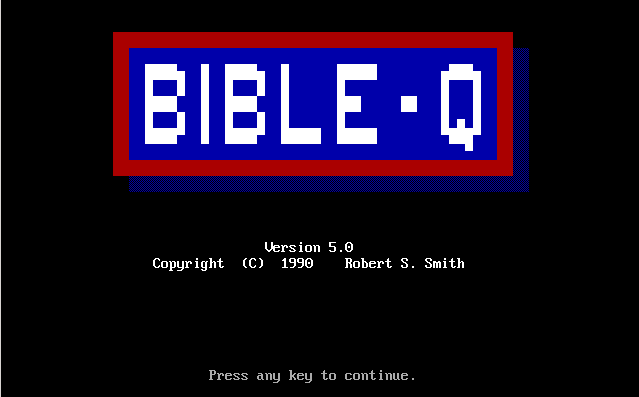 Bible-Q is a Bible quiz program. There are several levels of difficulty and option for one or more players. Installation is similar to Bible Companion; it is a DOS program and runs in DOSBox. It is shareware and instructions for registration are included with the programs (the readme files are actually executables which scroll the files) although at this point I have no idea whether the addresses given are still valid. I remember when I used Bluebeard as my word processor. 48K, and it included both Wordstar and Microsoft Word emulators. Anyway, thanks for the software — which I remember using back in my DOS 2.6 days. I’ll enjoy seeing it again, and may use it. And I’ll take a look at your Gospels. You should note, though, that I have a Republican sparring partner in Arkansas who insists that everyone should use the KJV because it has “English the way Jesus spoke it.” He isn’t moved by my observation that the turtle has no voice, except in the good King’s mistranslation of “turtle-dove” in Song of Solomon, and he tolerates me because I share his love for the KJV.